Monkey business proved to be a lucrative pastime Monday when paintings by Congo the chimpanzee sold at auction for more than $25,620. 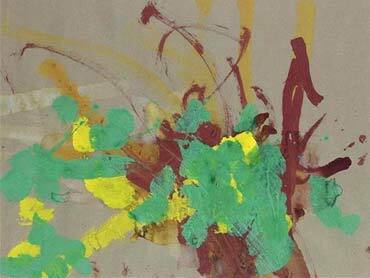 The collection of three tempera paintings - all abstract - were auctioned at Bonhams in London alongside works by impressionist master Renoir and pop art provocateur Andy Warhol. But while Warhol and Renoir's work didn't sell, bidders lavished attention on Congo's paintings. An American bidder named Howard Hong, who described himself as an "enthusiast of modern and contemporary painting," purchased the lot of paintings for $26,352 including a buyer's premium. The sale price surpassed predictions that priced the paintings between $1,000 and $1,500. "We had no idea what these things were worth," said Howard Rutkowski, director of modern and contemporary art at Bonhams. "We just put them in for our own amusement." Congo, born in 1954, produced about 400 drawings and paintings between the ages of 2 and 4. He died in 1964 of tuberculosis. His artwork provoked reactions ranging from scorn to skepticism among critics of the time. His fans may have included at least one artist: Pablo Picasso is reported to have hung a Congo painting on his studio wall after receiving it as a gift. "There's no precedent for things like this having been sold before," Rutkowski said.